About 2-weeks ago I got an (what I thought was a joke) email from Ligonier ministries about doing some part-time work for them while I finish my Th.M. at Puritan Reformed Theological Seminary. I was a little stunned in some ways, but was overly filled with joy in the fact that I could be able to help Ligonier ministry in someway, being in how much debt I am already to them for their work of the gospel ministry today. Now to what it is exactly I’ll be doing? I’ll be listening to over 1,500 lectures on various topics of theology from Dr. R.C. Sproul, and writing brief descriptions of them for their Teaching Series section on the New Ligonier website. Yes, 1,500 lectures, in one year, 6-hours a day, 5 days a week, for near 60 weeks. That’s a lot of lectures by one person! But if I had to listen to one man, R.C. it would be. 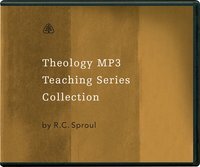 If you are interested in buying the complete collection of MP3 teaching series by Dr. Sproul on MP3 DVD ROM discs for a special discounted price at 70% off! This special collection includes five different categories filled with all the MP3 series available on that topic. See individual collection pages for included series. Over 1500 Messages regular $3000, for only $700! Be sure to asked me questions from time to time on how the lectures are going, what series of lecturers am I on, how it is going, etc. I’m sure after 3 to 4 months I’ll need some help to keep on going. I’ll be sure to twitter some thoughts and maybe even write up some blog post here and there to review how the process is going as I make my very long walk through the trail of RC’s teaching. Wish me luck God’s providence in this! You are going to benefit greatly from this. Think of all the great sermon illustrations you will get from listening to all those messages.